Only 100 cases of this gem produced. Great dark juicy fruit with uplifting aromatics and mouthwatering acidity. This wine has been quietly building a grassroots fan base over the years. Aperitif style SB with rich fruit and good zing. A splash for the pot and two for the chef. What started out as a weird experiment has now become a perennial 'go-to'. Different enough to stand out from the rosé crowd. 120 cases made. SUMMER 2019. There will be parties! Bay Area L&S fans, keep your eyes peeled. 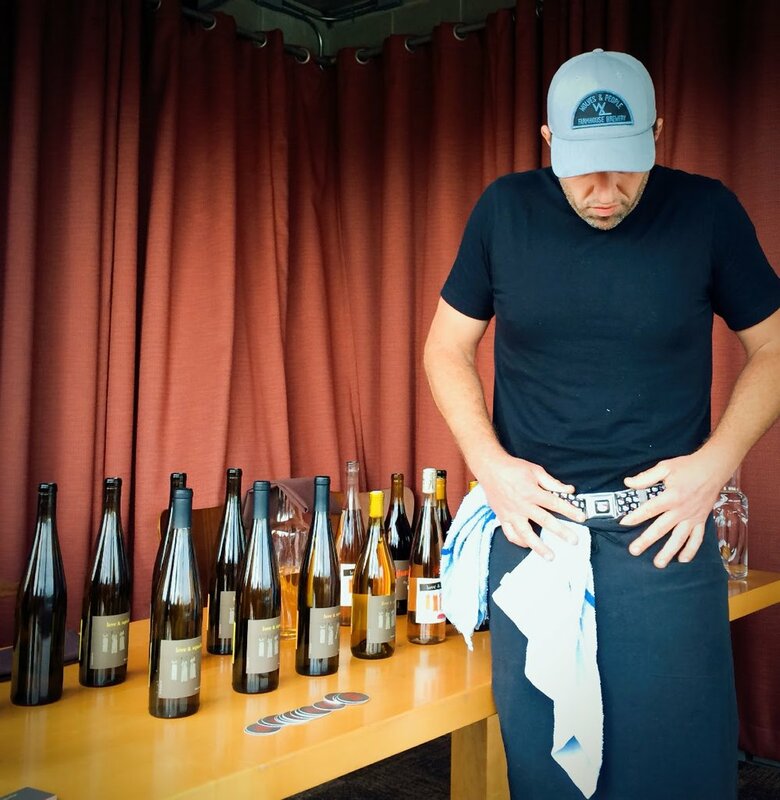 Matt will be headed down at the end of May for the First Ever WEST COAST RIESLING SOCIETY EVENT. West Coast Riesling Society will showcase of Riesling producers from California, Oregon and Washington with seminars, a grand tasting and dinners throughout SF 5/27-5/31 watch our social media for more info. INTERNATIONAL PINOT NOIR CELEBRATION: Matt has participated in IPNC as a Maitre d'Hotel since 2001, and has served on the board of directors for 6 years. This year he’s honored to be the board president and additionally Love & Squalor will be a featured winery. We look forward to seeing all of your familiar faces at the party, and if you've never had the opportunity to attend, well we can't recommend it enough. Feel free to reach out and we will tell you why you simply must experience the IPNC at least once. Beaujolais Nouveau in Portland, Oregon? Well, I don’t mind if I do! Gamay is Awesome. That's why Love & Squalor Gamay Noir (and the fabulous Corey Schuster) will be at the wonderful annual soirée hosted by ST. JACK restaurant & bar on November 16th. It’s time to give Oregon GaMay Noir its due. I Love Gamay wine festival is a first of its kind event that brings together adventurous wine lovers and Oregon Gamay producers for a great excuse to throw a party celebrating our favorite under-the-radar varietal. Ned Ludd & Elder Hall play host to two days of events that lets you get to know Oregon Gamay including an all Oregon Gamay tasting salon on day one and a multi-course dinner featuring legendary Portland chefs, Jason French and Cathy Whims with some storied local wine veterans on day two. Local producers and wine experts will be on hand to offer up their knowledge on this lesser known gem. Yes, Oregon Pinot Noir has earned its place in wine history, but we want to blow the lid off Oregon’s other noir rouge grape! We are holding a Dock Sale Wiener Roast All Love & Squalor wines will be available at 15-20% markdown. You must purchase at least 12 bottles (one case) according to OLCC regulations. Friends With Benefits Club members will receive an additional 15% off of that low low price. This is a one-time deal available on the day of the event only. We will have some special library wines and larger format bottles available, along with all of our usual releases. And yes, there will be hot dogs. Bring your friends. 5, 10, 15 Years of Noble RotSince 2002, Noble Rot has been pouring amazing wines, shaking superb cocktails, serving delicious dishes, and offering amazing views of Portland. “Pope Francis Declares Wine is a Necessity”* and we couldn’t agree more. To celebrate the Pope’s infinite wisdom (and his ability to state the obvious), we are holding a Dock Sale Wiener Roast All Love & Squalor wines will be available at 15-20% markdown. You must purchase at least 12 bottles (one case) according to OLCC regulations.